Wisdom teeth are the last teeth to erupt within the mouth. When they align properly and the gum tissue is healthy, wisdom teeth do not have to be removed. Unfortunately, this does not generally happen because of likely crowding and malposition of the erupting wisdom teeth. Why Choose 21st Century Dental for Wisdom Tooth Extractions? 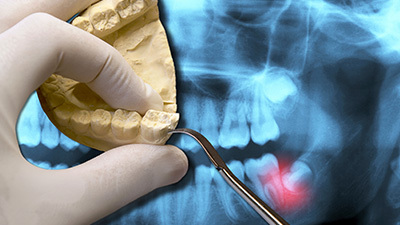 The extraction of wisdom teeth is necessary when they are prevented from properly erupting within the mouth. They may grow sideways, partially emerge from the gum, and even remain trapped beneath the gum and bone. Impacted teeth can take many positions in the bone as they attempt to find a pathway that will allow them to erupt successfully. These poorly positioned impacted teeth can cause many problems. When they are partially erupted, the opening around the tooth allows bacteria to grow and will eventually cause an infection. The result: swelling, stiffness, pain, and illness. The pressure from the erupting wisdom tooth may move other teeth and disrupt the orthodontic (the position achieved by your orthodontist) or natural alignment of teeth. 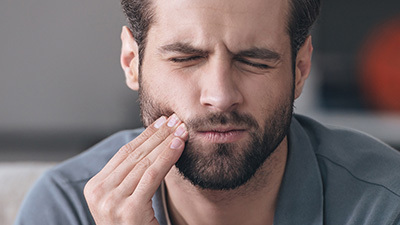 Although rare, the most serious problems occur when tumors or cysts form around the impacted wisdom tooth, resulting in the destruction of the jawbone and healthy teeth. Removal of the offending impacted tooth or teeth usually resolves these problems. Early removal is recommended to avoid such future problems and to decrease the surgical risk involved with the procedure. Every year of your life, your bone gets denser, raising the technical aspects of the surgery and increasing the chances of having delayed healing or bone support defects post-healing. 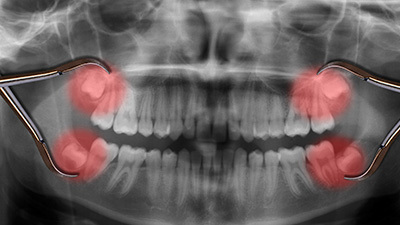 Wisdom teeth are a valuable asset to the mouth when they are healthy and properly positioned. Often, however, problems develop that require their removal. When the jaw isn't large enough to accommodate wisdom teeth, they can become impacted (unable to emerge or noticeably misaligned). Wisdom teeth may grow sideways, emerge only part of the way from the gum, or remain trapped beneath the gum and bone. To manage patient fear and anxiety, 21st Century Dental offers many types of sedation. We may recommend, for decayed or interrupted teeth, IV sedation. Contact us today to schedule your first appointment!